The New Orleans Opera Association formed in 1943, with the intention of starting a company and rebuilding the French Opera House. The company has been in existence ever since. Robert Lyall became the musical and general director in 1998, and one of his goals has been to expand the repertoire to include contemporary works. This month, the company is performing West Side Story, which should be a crowd favorite, especially with Louisiana natives in the leads. Recently, I spoke to Lyall about the company and the upcoming production. NOL: How long has opera been performed in New Orleans? 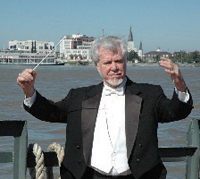 Robert Lyall: New Orleans has the longest operatic heritage on the North American continent. The first opera was given here in May of 1796. It’s not surprising when you consider that this was the main port for things coming in from Paris and the biggest city on the Gulf Coast. In the modern era, with Mardi Gras and Jazz Fest, the city has a psychological receptivity to opera. Opera is theater, drama, music, costumes. All of that is consistent with these other traditions. When did you become associated with the company? This is my ninth year. Prior to that, I was the music director of [Texas’ Victoria Symphony Orchestra and Tennessee’s Oak Ridge Symphony Orchestra] and the general and artistic director for the Knoxville Opera. I was also the artistic director of the Grand Rapids Opera in Michigan. Then I added the Mississippi Opera. When I was asked to take over the New Orleans Opera, I gave up [everything except] the job in Michigan. I’ve been the artistic director there for 20 years now. The New Orleans and Michigan companies are very different, and I enjoy the strong personalities and characteristics of each. The Theater for the Performing Arts, your company’s home, is reopening inJanuary 2009 and will also house the Louisiana Philharmonic and the NewOrleans Ballet. The opera and the ballet have had the theater as their home for many years. The symphony had the Orpheum, but it was seriously damaged during Katrina. The Theater for the Performing Arts was damaged but not as extensively. The Orpheum will come back in due course. The restoration of the Theater for the Performing Arts is on the fast track. How do you select your repertory? The core repertory of any company includes Verdi, Mozart, Puccini, Wagner, Strauss. Contemporary opera plays a relatively small role. My academic studies were in composition and musicology, so I’ve always had an interest in contemporary work. When I came to New Orleans, the company had a very traditional repertory. We still perform the chestnuts, but have added works like Andre Previn’s A Streetcar Named Desire and [George Gershwin’s] Porgy and Bess. More recently, we commissioned an opera by Thea Musgrave called Pontalba, in celebration of the Louisiana Purchase. We also did three of the four works in Wagner’s Ring Cycle. The last was scheduled for the 2005–06 season. Because of the storm we haven’t had a place to perform it. What attracted you to West Side Story? It’s the finest piece of musical theater written by an American to date. It picked up where Gershwin left off in terms of a musical language. Gershwin fused the worlds of jazz and classical music. Leonard Bernstein came right behind that era and wrote West Side Story, which is very much American jazz, but taken in a different direction. Another revolutionary aspect of WestSide Story is Jerome Robbins’choreography. Leonard Bernstein called West Side Story a choreographic musical. Clearly he was making a distinction between it and the other forms. Dance becomes such a fundamental part of the language. What’s involved in mounting theproduction? One great challenge is finding people who can do the dancing. They have to be Broadway-caliber dancers, but they also have to be actors. And they have to sing too. The concept of the Broadway triple threat is as real as it gets when you’re casting for this show. We hire principal artists from around the world for every production. In this case, I deliberately chose two people from Louisiana who [sing] in these major houses. Sarah Jane McMahon, from New Orleans, is Maria, and Matt Morgan, from Louisiana, plays Tony. I’m delighted to have two really beautiful young people, which is nice for the romantic leads. After all, this is a story about love at first sight. The performances are accompanied by members of the Louisiana Philharmonic. We’ve got the best players in the city. We’ve got all the necessary ingredients. I’m confident the audience will enjoy our production of this masterpiece.